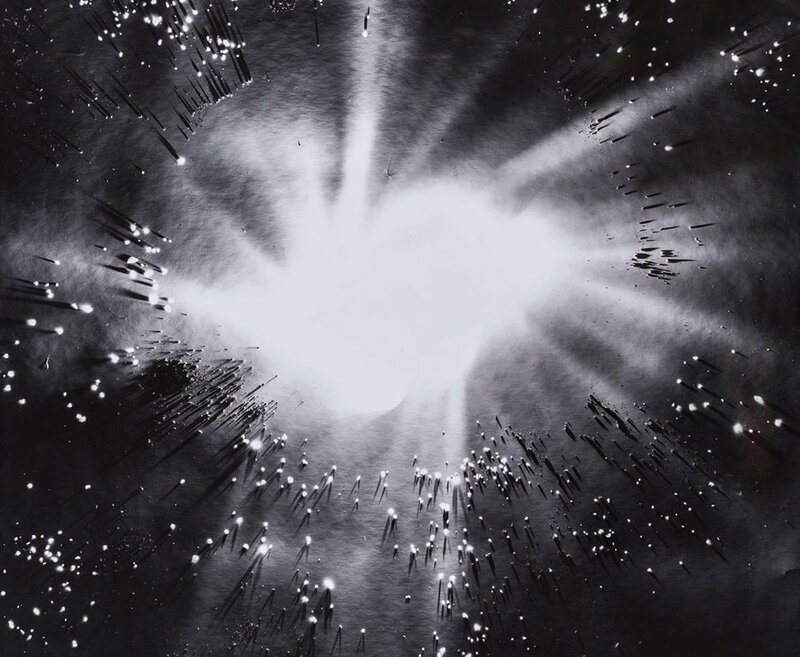 Anne Arden Mcdonald, Big Bang (detail), cameraless silver gelatin print, 2016, 40 x 30 in. Join us for a conversation with Light in Wartime curator Rola Khayyat about alternative photographic processes as we visit the studios of three artists who are pushing the boundaries of the medium. We will meet the artists in the intimacy of their studios and learn about their methods in a discussion about their work. Anne Arden McDonald works in photography (with and without cameras), sculpture, printmaking, and installation. From ages fifteen to thirty she made photographic self portraits by building installations in the landscape or in abandoned interiors, performing privately for her camera in these spaces. More recently she has been making process-inspired images and site-specific installations that include photography and sculpture. Her work has been exhibited in contexts that range from self-portrait, staged, ritual, plastic camera, antique process, and experimental photography, to sculptural installations as large as a room and as small as a pocket watch. McDonald’s work has been exhibited widely and appeared in many publications, including Aperture, European Photography, and Eyemazing Magazines. Her work is in the collection of The Houston MFA, The Denver Art Museum, The Detroit Institute of Art, and the Bibliotheque Nationale in Paris. She has taught for six years at Parsons School of Design. Alice Quaresma experiments with materials that allow her photographs to be sensorial and playful, pushing the boundaries of photography as a flat surface by incorporating acrylic paint, paper, tape, and pencil onto photographic prints. Using images from her personal archive, she elaborates on the idea of displacement and identity, and takes the instability of the immigration condition as a main source of inspiration. She is the recipient of the Foam Talent Prize in Amsterdam and has published in major magazines, newspapers and websites in Brazil, Japan, the United States, and Europe. She earned her MFA from Pratt Institute in 2009 and was selected as a PS122 Exhibition Prize winner that same year. Blond Jenny is a painter, photographer, and performance artist based in New York City. Through her alter ego cartoon character Blond Jenny, self-portraits, found objects from nature, 360 photos and video, and lenticular printing, she tells stories about her life experiences, social evolution, and culture. She has shown at Kathryn Markel Fine Arts, Hong Kong Affordable Art Fair, Clio Art Fair, Spectrum Miami Art Show, and Nabi Museum of the Arts, and in numerous group exhibitions.